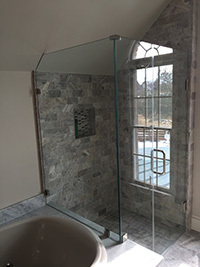 We create custom showe enclosures that provide a sumptuous showering experience that you will enjoy each time you step into your new custom shower enclosure. We can custom design a Frameless, or Framed Shower Enclosure that is streamlined and smart looking, elevating the look of your bathroom. This simple but elegant upgrade adds a touch of luxury to your bathroom that will also enhance the value of your home. Your new glass enclosure can be etched with a lovely pattern that matches the style of your bathroom. Call us today to discuss your ideas with our designer. We are happy to give you a free estimate. Visit our shop for a design consultation in Gaithersburg, Maryland. 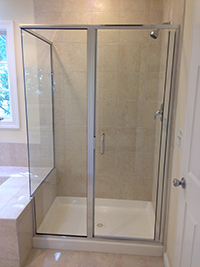 We can streamline your bathroom with a new custom framed shower enclosure. Your shower or tub and shower combination can look modern and stylish with all the latest trends in framed enclosures. With our design experience we can help make your decision simple and easily transform your old bathroom into an updated version showcasing your beautiful new glass shower doors or shower surround. You can step into tranquility; your Frameless shower enclosure visually allows your bathroom elements to not compete, so you can focus on what matters most. The advantages of frameless… Frameless shower doors provide a simple and sleek option that enhances the look of your bathroom and is easy to clean. 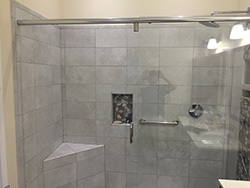 Design Glass & Mirror are certified service technicians and can install, repair or replace your shower doors or shower enclosures. Need a repair, just call us now!